Palabras clave: Brasil, ciberseguridad, gobernanza de internet, liderazgo regional. El artículo analiza la estructuración de la política de ciberseguridad de Brasil entre los años de 2003 y 2016 como componente de su estrategia de inserción internacional y proyección de liderazgo en el Sul Global. El campo de la gobernanza de la Internet, de lo cual la ciberseguridad es parte, ofrece al país una oportunidad de relativo bajo costo de protagonismo en la elaboración de normas internacionales. Analizase documentos principales de esa política y argumentase que ella es parte de los esfuerzos de proyección del soft power del país en el campo de la seguridad internacional, pero que sus incoherencias pueden afectar y hasta mismo comprometer esta estrategia. Por fin, trazase breves proyecciones para esta política ante los cambios políticos en Brasil. The article analyzes the structuration of Brazil’s cybersecurity policy between the years of 2003 and 2016 as a component of its strategy of international insertion and projection of leadership in the Global South. The Internet governance field, of which cybersecurity is a part, offers the country a relatively low-cost opportunity of protagonism in the elaboration of international norms. It analyzes cornerstone documents of this policy and argues that it is a part of the country’s efforts to project its soft power in the field of international security, but that its incoherencies can affect and even compromise the strategy. Finally, it draws brief projections to this policy in face of political changes in Brazil. Abdenur, Adriana. 2014. “Brazil and Cybersecurity in the Aftermath of the Snowden Revelations”. En International Security: a European-South American Dialogue, 229-283. Río de Janeiro: Konrad-Adenauer-Stiftung. Ablon, Lillian, Martin C. Libicki y Andrea A. Golay. 2014. Markets for Cybercrime Tools and Stolen Data: Hackers’ Bazaar. Santa Mónica: RAND. Alden, Chris, Sally Morphet y Marcos Antonio Vieira. 2010. The South in World Politics. Basingstoke: Palgrave Macmillan. Artigo 19. 2016. Brasil: Análise da Estratégia de Cibersegurança. São Paulo: Artigo. Balzacq, Thierry. 2011. “A theory of securitization: origins, core assumptions, and variants”. En Securitization theory: how security problems emerge and dissolve. Nueva York: Routledge. Barnard-Wills, David, y Debi Ashenden. 2012. “Securing Virtual Space: Cyber War, Cyber Terror and Risk”. Space and Culture: 110-123. Bendrath, Ralf, Johan Eriksson, e Giampero Giacomello. 2007. “From ‘cyberterrorism’ to 'cyberwar', back and forth: How the United States securitized cyberspace”. International Relations and Security in the Digital Age, J. Eriksson y G. Giacomello, 57-82. Nueva York: Routledge. Betz, David J., y Tim Stevens. 2013. “Analogical reasoning and cyber security”. Security Dialogue: 147-164. BID (Banco Interamericano de Desarrollo). 2016. “Ciberseguridad: ¿Estamos preparados en América Latina y el Caribe?”, https://publications.iadb.org/handle/11319/7449?locale-attribute=es&. Brasil. 2015. Estratégia de segurança da informação e comunicações e de segurança cibernética da administração pública federal 2015-2018. Brasilia: Presidência da República. ________. 2012. Política Cibernética de Defesa. Brasilia: Ministério da Defesa. ________. 2008. Estratégia Nacional de Defesa. Brasilia: Ministério da Defesa. Buzan, Barry, Ole Waever, y Jaap de Wilde. 1998. Security: a New Framework for Analysis. Londres: Lynne Rienner Publishers. Castells, Manuel. 2010. The rise of the network society. Malden: Blackwell. Cruz Júnior, Samuel Souza da. 2013. A Segurança e Defesa Cibernética no Brasil e uma Revisão das Estratégias dos Estados Unidos, Rússia e Índia para o Espaço Virtual. Río de Janeiro: IPEA. CSIS. 2010. Cybersecurity two years later: a report of the CSIS Commission on Cybersecurity for the 44th Presidency. Washington DC: Center for Strategic and International Studies. CSIS. 2008. “Securing Cyberspace for the 44th Presidency: A Report of the CSIS Commission on Cybersecurity for the 44th Presidency”. Center for Strategic and International Studies, Washington DC, 90. Day, Ronald E. 2001. The Modern Invention of Information: Discourse, History and Power. Carbondale: Southern Illinois University Press. Decreto nº4.829/2003, de 3 de setembro, dispõe sobre a criação do Comitê Gestor da Internet no Brasil - CGI.br, sobre o modelo de governança da Internet no Brasil e dá outras providências (D.O.U de 4 de setembro de 2003). Decreto nº3.505/2000, de 13 de junho, institui a política de segurança da informação nos órgãos e entidades da Administração Pública Federal (D.O.U de 14 de junho de 2000). Deibert, Ronald J. 2013. Black Code: inside the battle for cyberspace. Oxford: Signal. ________. 2011 “Tracking the emerging arms race in cyberspace”. Bulletin of the Atomic Scientists 67 (1): 1-8. Deibert, Ronald J., y Rafal Rohozinski. 2010. “Risking Security: Policies and Paradoxes of Cyberspace Security.” International Political Sociology: 15-32. DeNardis, Laura, y Francesca Musiani. 2016. “Governance by infrastructure”. En The turn to infrastructure in Internet governance, 3-24. Londres: Palgrave MacMillan. DeNardis, Laura. 2009. Protocol Politics: The Globalization of Internet Governance. Cambridge: MIT Press. DeNardis, Laura, y Mark Raymond. 2013. “Thinking Clearly about Multistakeholder Internet Governance”. Eighth Annual GigaNet Symposium, 21 de Octubre. Diniz, Gustavo, Robert Muggah y Misha Glenny. 2014. “Deconstructing cyber security in Brazil: Threats and responses”. Strategic Paper 11: 3-32. Dunn Cavelty, Myriam. 2012. “The Militarisation of Cyberspace: Why Less May Be Better”. 4th International Conference on Cyber Conflicts, 141-153. ________. 2016. “Cyber-security and private actors.” Em Routledge Handbook of Private Security Studies, Abrahansen, Rita y Anna Leander. eds. Nueva York: Routledge. ________. 2008. Cyber-Security and Threat Politics: US Efforts to Secure the Information Age . London: Routledge. ________. 2015. “The Normalization of Cyber-International Relations.” Em Strategic Trends 2015: Key Developments in Global Affairs. CSS. Dunn Cavelty, Myriam., y Mark Daniel Jaeger. 2015. “(In)visible Ghosts in the Machine and the Powers that Bind: The Relational Securitization of Anonymous”. International Political Sociology: 176-194. Dutton, William H. 2015. “Multistakeholder Internet governance?”. Background Paper: Digital Dividends. Epstein, Dmitry, Christian Katzenbach, y Francesca Musiani. 2016. “Doing internet governance: practices, controversies, infrastructures, and institutions”. Internet Policy Review. Eriksson, Johan, y Giampero Giacomello. 2009. “Who Controls the Internet? Beyond the Obstinacy or Obsolescence of the State”. International Studies Review, 205-230. Flyverbom, Mikkel. 2016. “Disclosing and concealing: internet governance, information control and the management of visibility”. Internet Policy Review, 30 de septiembre. Fontenelle, Alexandre S. 2012. “O Espaço Cibernético na Agenda Internacional”. ECEME, XI Ciclo de Estudos Estratégicos. Gonzaga, Alexandre. 2016. “Jungmann apresenta ao presidente Temer a revisão dos documentos de defesa”, http://www.defesa.gov.br/noticias/24840-jungmann-apresenta-ao-presidente-temer-a-revisao-dos-documentos-da-defesa. Hansen, Lene., y Helen Nissenbaum. 2009. “Digital Disaster, Cyber Security, and the Copenhagen School”. International Studies Quarterly: 1155–1175. Internet World Stats. 2016. “Internet usage and population in South America”, http://www.internetworldstats.com/stats15.htm. Justribó, Candela. 2014. 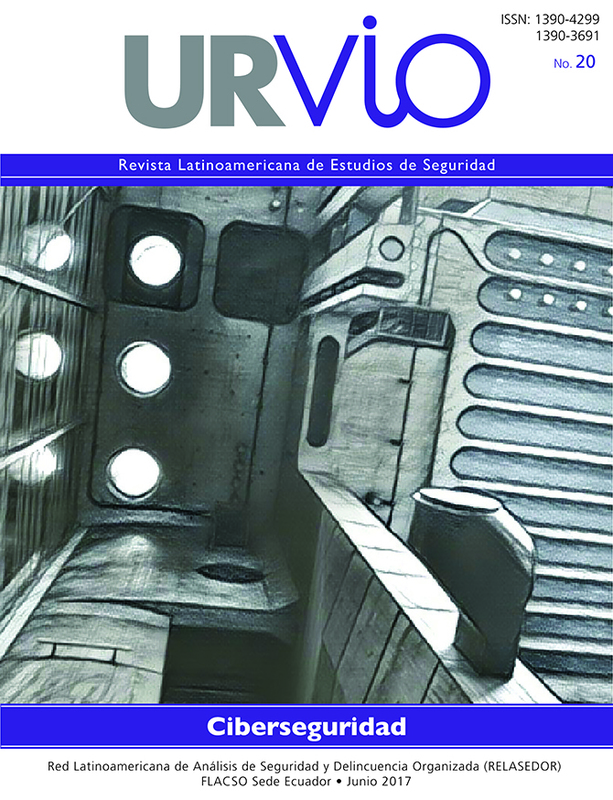 “Ciberdefensa: una visión desde la UNASUR”, http://www.congresos.unlp.edu.ar/index.php/CRRII/CRRIIVII/paper/view/1849/422. Keohane, Robert., y Joseph Nye. 1998. “Power and Interdependence in the Information Age”. Foreign Affairs 77 (5): 81-94. Lee, Stacia. 2017. “The Cybersecurity Implications of Chinese Undersea Cable Investment”. The Henry M. Jackson School of International Studies. Lopes, Gills. 2013. “Securitizando o ciberespaço: um estudo comparativo sobre a defesa cibernética em sete países”. 4º Encontro Nacional da ABRI. Belo Horizonte. Maciel, Marília Ferreira, y Carlos Affonso Pereira de Souza. 2011. “Multi-stakeholder participation on Internet governance: An analysis from a developing country, civil society perspective”. Association for Progressive Communications. Maciel, Marilia Ferreira, Nicolo Zingales, y Daniel Fink. 2015. “NoC Internet Governance Case Studies Series: The Global Multistakeholder Meeting on the Future of Internet Governance (NETmundial) ”. SSRN. Mandarino Junior, Raphael, y Claudia Canongia. 2010. Livro Verde: Segurança Cibernética no Brasil. Brasília: GSIPR/SE/DSIC. ___________. 2016b. “XII CDMA: Ministro Jungmann defende cooperação regional nas fronteiras”, http://www.defesa.gov.br/noticias/25195-xii-cmda-ministro-jugmann-defende-cooperacao-regional-nas-fronteiras. Mueller, Milton, Andreas Schmidt, y Brenden Kuerbis. 2013. “Internet Security and Networked Governance in International Relations”. International Studies Review, 86–104. Mueller, Milton, y Hans Klein. 2014. “Sovereignty, National Security, and Internet Governance: Proceedings of a Workshop”. Syracuse University: Georgia Institute of Technology School of Public Policy. Muggah, Robert, y Thompson Nathan. 2015. “Brazil's Cybercrime Problem”. Foreign Affairs. NATO. 2016. “NATO Cyber Defense Fact Sheet”, http://www.nato.int/nato_static_fl2014/assets/pdf/pdf_2016_07/20160627_1607-factsheet-cyber-defence-eng.pdf. Nissenbaum, Helen. 2005. “Where Computer Security Meets National Security.” Ethics and Information Technology, 61-73. Nye, Joseph. 2004. Power in a global information age: from realism to globalization. Nueva York: Routledge. Oppermann, Daniel. 2014. “Internet governance and cyber security in Brazil”. En International Security: a European-South American Dialogue, 167-182. Río de Janeiro: Konrad-Adenauer-Stiftung. Portal Brasil. 2015. “Forças Armadas vão monitorar redes de Internet na Rio 2016”, http://www.brasil.gov.br/defesa-e-seguranca/2015/09/forcas-armadas-vao-monitorar-redes-de-internet-na-rio-2016. Rid, Thomas. 2012. “Cyber War Will Not Take Place”. Journal of Strategic Studies 35(1). Stuenkel, Oliver. 2015. India-Brazil-South Africa Dialogue Forum (IBSA): The Rise of the Global South? Londres: Routledge. van Eeten, Michel JG., y Milton Mueller. 2012. “Where is the governance in Internet governance?”. New Media & Society: 720-736. WSIS. 2005. “Tunis Agenda for the Information Society, WSIS-05/TUNIS/DOC/6(Rev.1)-E.”, http://www.itu.int/net/wsis/docs2/tunis/off/6rev1.html. Zakaria, Fareed. 2008. The Post-American World. Nova York: W. W. Norton & Company.